http://www.line-stickers.com/ – Kyary Pamyu Pamyu × Crayon Shinchan Line Sticker | It’s a dream collaboration between Kyary Pamyu Pamyu and Crayon Shinchan drawn especially by Yoshito Usui and UY Studio for these stickers! 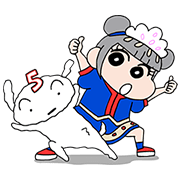 With all of Kyary’s fashion and poses, you’ll definitely want to use these stickers everyday! Overactive Horse!! Very Grean Duk Dik My Melody’s Second Cousin A lot of cats. – Animated!